If you follow me on twitter, you probably already know that I got offered a job as a marketing manager for a new fashion retail establishment. Their line doesn't appeal to me much but still, it's in fashion and a pretty good position too. I was supposed to have a final screening yesterday afternoon. When I mentioned it to Dennis, he wasn't enthusiastic about it at all. Then, he later admitted that he prefers to have me at home with my daughter and himself. Some of you might probably be put-off by such old-fashioned thinking. I know that personal feminine empowerment is the in thing nowadays. For me, however, I thought that his suggestion to just stay at home was sincerely sweet. I am not a fantastic homemaker after all. Just average, but the fact that he likes me being around further confirms in my heart that we are partners in life who are lucky enough to be each other's best friend as well. Still, I couldn't help but ponder on the thought of being a fast-paced, ultra-chic career woman. Then I remembered how much it saddens me that my daughter, now four going on five, is growing up too fast. I am by her side almost every single minute but still time seems to just fly by and I miss her being a little baby in my arms. All sweet and pink, soft and helpless. With these thoughts, I realized that maybe I am no longer cut out for that lifestyle. I just wouldn't be able to bear being away from her for such long hours every single day. I would miss all her little innocent and funny anecdotes and I don't think I can ever live with that. just stay with your daughter na lang heheh it's hard being a working mom and you're lucky you have all the time in the world to be beside her always. kisses! 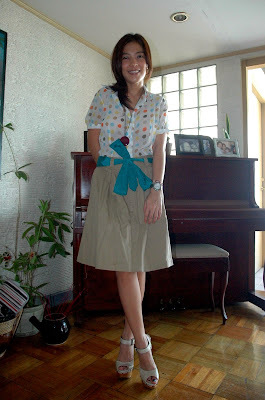 love the outfit especially the skirt. awww. 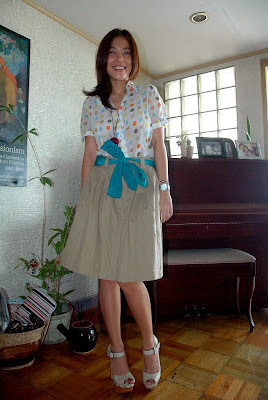 sana naman i can find my own dennis para i can stop working and be a fashionable mom/wife like you. don't get me wrong, i have twisted point of views if it's considered twisted. i like to be called an empowered career woman but sometimes i just wish someone comes into my life and tell me to be with the family and focus on being a wife or mom. cute outfit! i understand your dilemma. i'm going through something similar now. been working straight for the past 10 years. now that i have a one year old who is growing up so fast, i'm contemplating on slowing things down so i don't miss out on the good stuff. Happy for you that you can stay at home w/ your daughter ,enjoy every moment that you'd be w/her and so nice to know that you also thankful for all the blessings and privileges that you have! and oh! btw luv your sandals! awwww, makahanap nga ng dennis para sa akin! you're husband is so sweet... and i love that you're with your daughter always. This outfit is beyond cuuute!!! love the outfit. i think it's nice to hear women being out in the working field considering that there are many men who still would want the woman to stay at home. Congrats on the job offer in progress. Funny I would prefer to stay home with the kids but my husband prefers I work. Yours is the opposite. Both choices were the right ones! Being a mom and a wife its a full-time job too... not always pay with money, but it is truly full of joy. Enjoy your family! u r such a lucky woman! i love that you have fun w. fashion! lovely outfit!! AHH That is such a cute outfit! I love the turquoise bow! I love this outfit! The bright colours totally modernize the silhouette! I totally hear you on the Stay at home mom issue. No one ever says that so and so was so successful at raising a good kid, instead they praise the "breadwinner" for having a great job. I get a little frusterated taking the back seat!